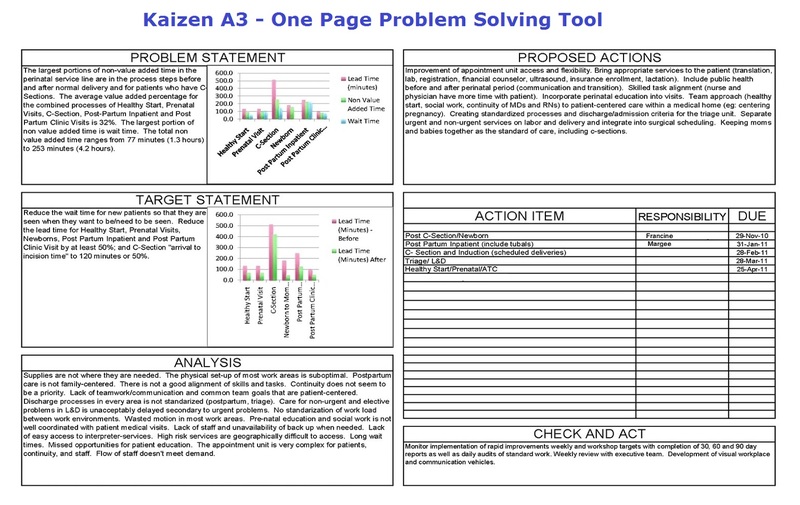 Kaizen A3 – Kaizen A3 Analysis – Kaizen One Page Problem Solving Tool – Kaizen problem solving tool – Kaizen template – Kaizen A3 Framework – Kaizen A3 is a lean six sigma problem solving tool, which allows to quickly identify the problem, analyze the issues and provide recommendations and action plan with identified owners. This Lean Six Sigma A3 method was designed as a workshop tool, allowing a work group to stay focused on the problem. Usually, within a span of a day, often within 3 hours, a team can work through a difficult problem and come up with an actionable list of recommendations. All of this fits into 1 page, hence the name – A3.